Rubber softfall surfacing is becoming one of the most sort after flooring materials to use for safety surfacing in many areas such as playground surfaces, childcare centres, running tracks and aged care facilities just to name a few. It is made of a recycled product that comes in a granulated form in many different colours. The rubber granules are mixed with a PU binder to form a hard wearing seamless surface. It can be applied over most hard surfaces such as concrete, pavers, road base or compacted crusher dust. The rubber softfall product is made up of a non-toxic recycled rubber, this being great for our environment as it reduces landfill. It’s not hazardous and requires minimal maintenance and it provides a slip-resistant surface. The surface is porous and it is a soft and durable product which has been designed to absorb impact. Softfall products are fully compliant with all relevant Australian Safety Standards. As the product comes in numerous colours and creates a seamless surface it provides an attractive, durable, trip resistant hard wearing surface for any area. 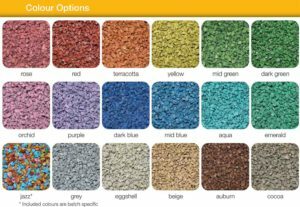 We can customise the colour and design to match your playground’s colour scheme, or to match existing surfaces in the area. We can even create patterns, hopscotch grids, animals and much more it’s just up to your imagination! Contact us today to discuss your Rubber Softfall Surfacing Needs.